Was this random vandalism or misguided environmental activism? Farming leaders in Canterbury hope a spate of vandalism was not motivated by radical environmentalists. On Friday night, October 20, a valve was opened on a vat allowing about 6000 litres of milk to escape on a Leeston dairy farm and the same night 30 tyres on four irrigators on a Hororata farm, an hour’s drive away, were punctured by a battery-powered drill. The dairy farmer whose vat was opened was Environment Canterbury councillor John Sunckell who said he was at a loss whether it was a burglar frustrated at not getting access to anything valuable or an environmentalist wanting to make a statement. “I don’t want to draw a conclusion but it is hard not to,” he said, referring to the irrigator tyre slashing incident on the same night. Sunckell said police asked him if it could have been a disgruntled employee but he did not think so. In recent months Greenpeace activists had illegally occupied the Central Plains Water irrigation scheme, other environmental groups had openly pursued an agenda opposing irrigation and surveys in Christchurch had shown opposition to farming and irrigation. Sunckell said he was talking publicly about the incident because the vandalism was reflective of a growing split in the community. The volume of milk exceeded the capacity of the drainage and wetland filtering and containment system and the milk overflowed into a drain then a waterway. So the vandalism caused pollution. North Canterbury Federated Farmers dairy section chairman Michael Woodward hoped the two incidents were not motivated by anti-farming sentiment. If it was environmentalists, it was counterproductive given the tyres would be dumped and the milk ended up in a waterway, both damaging to the environment. Irrigation was a contentious issue in Canterbury and Woodward said he would be disappointed if activists chose to vandalise private property to promote their cause instead of talking to farmers. The federation’s provincial president Lynda Murchison was also reluctant to speculate on a motive but said if it was environmentalists she was saddened and fearful that people misinformed about water quality issues and the role of irrigation would resort to those tactics. “Angry people damaging property never got anyone anywhere.” . . Whether or not the vandals were environmental activists they’ve not only broken the law they’ve added to pollution and waste. Federated Farmers’ new president, Katie Milne, is the first woman to hold the office. West Coast dairy farmer Katie Milne is the new Federated Farmers’ National President- becoming the first woman in the Federation’s 118-year history to hold the presidency. Ms Milne succeeds Dr William Rolleston who steps aside after his three-year tenure. A previous Federation Board member and West Coast Provincial President, Katie was Dairy Woman of the Year and a Rural Woman of Influence in 2015. She contested the position with Anders Crofoot who was vice-president. Manawatu dairy farmer Andrew Hoggard was elected National Vice President while South Canterbury farmer Miles Anderson takes over as National Meat and Fibre chair with Rick Powdrell stepping aside. Waikato farmer Chris Lewis takes over as National Dairy Industry Chair succeeding Andrew Hoggard. North Canterbury farmer Lynda Murchison has been elected as one of two Board members at large alongside Chris Allen who was reappointed. Arable chair Guy Wigley remains on the Board pending next week’s arable sector AGM. . .
Federated Farmers like all voluntary organisations faces challenges with membership but still plays a vital role advocating for the farming industry and rural people. Feds and its president play a very important role, especially now farmers are such a small minority and the rural-urban gap is widening. Bringing in supplementary feed is no longer an option for drought-stricken north Canterbury farmers. Rain at the weekend brought some hope to replenishing food stocks, but it will be a long haul before the herds could return. Federated Farmers north Canterbury president Lynda Murchison says feeding livestock is unsustainable. “This drought is so prolonged and so widespread that bringing feed in is not really an option anymore. The amount of feed you have to bring in is just too big.” . .
Federated Farmers is mystified as to why people are still complaining about the use of 1080, long after it’s been established as a key tool in New Zealand’s environmental protection system. The Commissioner for the Environment concluded five years ago that 1080 was the only viable tool for protection against pests on much of New Zealand’s conservation land. Federated Farmers Taranaki vice president Donald McIntyre says the Department of Conservation’s planned use of 1080 on Mount Taranaki this month must go ahead. “If we want to keep the kiwi, the rata and all the rest of New Zealand’s native flora and fauna, then we have to accept the use of 1080,” he says. 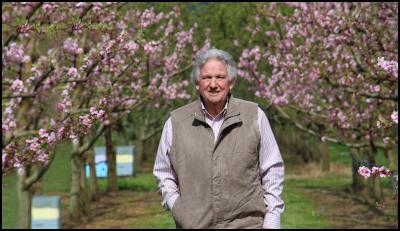 . .
Horticultural pioneer John Paynter, whose lifetime ambition is seeing Hastings Heretaunga Plains planted in fruit trees, is this year’s recipient of the Pipfruit New Zealand Award for Outstanding Contribution to the Pipfruit Industry. Mr Paynter is the first grower in New Zealand to receive the award since it was established in 2013. He was presented with the award at the Horticultural Conference and Awards dinner held in Nelson last night – home to where his family first started growing apples in 1862. . . The Ministry for Primary Industries will be holding six hui and public meetings around the country during August and September, to give New Zealanders the opportunity to join a national conversation about managing biosecurity risks to New Zealand. At the meetings, people will be asked their views about how we can all work together to keep New Zealand free from pests and diseases, because our lifestyles, livelihoods, environment, and the growth of our nation depend on it. . .
A high country sheep farmer wants the government to introduce two types of moth into New Zealand to help control a putrid-smelling lucerne crop weed called horehound. Horehound looks like mint and is recognised as one of the worst lucerne weeds – sticking to sheep wool and reducing its value, and it can also taint the meat if large amounts are eaten. Lake Tekapo farmer Gavin Loxton, who formed the Horehound Biocontrol Group, is working with Landcare Research to survey farmers and then apply for government funding to introduce two moths to control it. . .
An international study has narrowed down the biggest risks for pollinators, with the hope of preventing further threats to global food production. The research identified six risks that need urgent attention, including corporate control of agriculture, diversifying pollinator species, the effects of climate change and reducing chemicals in non-agricultural settings. David Pattemore from Plant & Food Research was a co-author of the study, and said the findings were mixed. . . . Entering the Auckland Ballance Farm Environment Awards gave Patumahoe dairy farmers Brian and Pirkko Gallagher a chance to showcase some of the good work they’d been doing on their farm. “We’d only recently finished installing our new effluent system and so we were keen to show that off to the judges and see what they thought of it,” Brian says. The Gallaghers also wanted to acknowledge the support of Auckland Regional Council, which provided assistance for the planting of trees and shrubs around the five-million litre pond. Brian says the Ballance Farm Environment Awards (BFEA) offered a valuable outside perspective of their farming operation. . .
(BusinessDesk) – Zespri International, the kiwifruit marketer, is due to resume shipments to China later this week following an overhaul of the process for checking kiwifruit prior to export. On Aug. 5, the Tauranga-based company said it had temporarily halted exports to the country after China’s General Administration of Quality Supervision, Inspection and Quarantine (AQSIQ) issued a risk notification and strengthened inspection and quarantine processes on New Zealand kiwifruit entering Chinese ports when it found the fungus Neofabraea actinidiae. It causes fruit to rot but has no food safety implications. Prime Minister John Key last week insisted that there was no link between Zespri’s problems and reports that China had threatened to retaliate if New Zealand launched an investigation into whether Beijing was selling steel to NZ below cost, a practice known as ‘dumping’. Key told his weekly media conference that “people should be careful about joining dots.” . .
Young sheep industry leaders from New Zealand, Australia and the United States are getting together in New Zealand this week to discuss common interests and look at the New Zealand sheep industry first-hand. The trip is one of the annual activities of the Tri-Lamb Group, giving young leaders a taste of sheep farming in each of the three member countries, and this time, showcasing New Zealand’s unique farm management systems. Beef + Lamb New Zealand’s Northern South Island Farmer Director, Phil Smith says the forum is designed to encourage young producers and leaders from the three countries to share ideas, network and to broaden understanding of sheep production practices in all three countries. . .
Primary Industries Minister Nathan Guy says farmers throughout the eastern South Island are still feeling the effects of drought, particularly in North Canterbury. “It’s likely the medium-scale adverse event classification will remain in place until August or September this year, depending on conditions over autumn,” says Mr Guy. “Despite recent rainfall, farmers and growers are still feeling the impacts of these prolonged dry conditions. “In particular, the driest area is around Cheviot in North Canterbury which has been largely missed by most of the recent rainfall. . .
Federated Farmers North Canterbury say farmers affected by the drought are facing a tough year ahead and will be struggling with some tough decisions. “It is not a great time for farmers in North Canterbury, most of us are facing a year of little to no feed, low stocking rates and substantial financial losses,” says Dan Hodgen, Federated Farmers Meat & Fibre Chair. “With the drought leaving us with a significant lack of grass and crop growth, we are either having to sell capital stock at a much lower rate than we usually would or having to buy in supplementary feed. Some farmers are doing both.” . . .
North Canterbury farmers already in the grip of their worst drought in 60 years have been dealt another blow today. NIWA says we are on the cusp of an El Niño weather pattern, meaning things are about to get even drier in the east and wetter in the west. Canterbury’s trademark Nor’west winds are exactly what drought-stricken farmers don’t need. “When you just get the wind likes this it’s stripping out the moisture in it,” says Federated Farmers north Canterbury president Lynda Murchison. . .
(http://www.imf.org/external/pubs/ft/wp/2015/wp1589.pdf). As part of its findings, the report recommended further investment in irrigation. . . The Bay of Plenty region and its industries could grow substantially thanks to its resource, population, location and climate advantages, a newly published report reveals. Economic Development Minister Steven Joyce and Primary Industries Minister Nathan Guy today released the Bay of Plenty Regional Growth Study, which shows that the region has a number of natural advantages and is well placed to attract further investment, raise incomes and increase employment. “This study provides a detailed summary of the opportunities for the Bay of Plenty’s future,” Mr Joyce says. “It outlines the potential of the primary sector, manufacturing and tourism industries in particular to grow the region. . . . The kiwifruit industry came together to thank the Government for its support with efforts to manage the bacterial disease Psa, when the Prime Minister John Key visited Zespri’s Mt Maunganui office this afternoon. Zespri chairman Peter McBride says senior representatives of postharvest, growers and industry organisations took the opportunity to show the Prime Minister how far the industry has come since Psa was first discovered in New Zealand in 2010. “It’s hard to recall now just how uncertain and dark those days were, when we simply did not know how the industry could continue with Psa. . .
South Canterbury farmers expect their region to be declared a drought zone before the end of the month, unless rain falls. Dairy farmer Brent Isbister predicts milk production on his farm will be back at least 15% for the season going on the way his business is tracking with the emerging drought. Before December his 1150-cow herd was producing 3% ahead of last year but with water restrictions since mid-December, milk flow was now 20% down. . .
North Canterbury farmers in dry hotspots are two to three weeks away from a drought. Farmers are calling the dry run typical for North Canterbury after easier summers lately and a return to the summers of their youth. They are feeding stock extra supplies and have de-stocked ewes from properties and sold lambs to the store market which they might normally finish themselves to get better prices. Federated Farmers North Canterbury president Lynda Murchison said farmers around their sheep and beef property in Weka Pass were dry and would go into drought without rain in the next few weeks. . .
Fonterra’s New Zealand collection is 4% higher for the season to date but the dairy co-operative issued a warning about the effect dry conditions were having on the east coast of the South Island. Farmers would be watching closely as irrigation restrictions might be put in place. Fonterra released statistics for the seven months to December and said the collection rate was 3% higher in December than in the previous corresponding period, as well as being 4% higher for the seven months. . . The ASB Commodity Price Index started the year with a fall in all denominations, mainly due to the dipping sheep/beef index. The 2.7% fall in US dollar terms in the sheep/beef index was largely shared by beef (price down 3.4%) and lamb (down 2.7%). Dairy prices were flat before the 3.6% overall rise in the GlobalDairyTrade auction. ASB rural economist Nathan Penny said the year started with commodity markets very much in the headlines. . .
Forest and Bird says clearing pests from New Zealand would have significant economic benefits for the country’s primary production and public health. The Predator Free New Zealand Trust aims to clear New Zealand of rats, stoats and possums in just a few decades by concentrating research on new removal techniques such as introducing infertile males. Forest and Bird spokesperson Kevin Hackwell said vertebrate pests cost the primary production sector about $3 billion a year. . .
It’s been said that the New Zealand economy is likely to be the “rock star” of 2014 but we all know what happens to rock stars who spend all their money on having a good time. I’ve said it before – the only way we’re going to become a top-tier First World country is by growing the pie. To judge the dead may give some comfort to the living, but no matter how fervently the misdeeds of previous generations are condemned, they cannot be undone. Therefore, whatever justice we seek to do here and now, let it be to right the wrongs of the present – not the past. We fair-skinned Polynesians are not – and can never be – “Europeans”. Just as contemporary Maori are not – and can never be again – the Maori who inhabited these islands before colonisation. Both of us are the victims of historical forces too vast for blame, too permanent for guilt. Just 380,000 individuals pay half of all income tax. Democracy, certainly at candidate selection level, isn’t generally a process of exquisite delicacy, scrupulous manners and sensitivity to hurt feelings. Oftentimes it’s just a few steps removed from full-on internecine civil warfare, albeit conducted largely out of sight. – Southland Times commenting on Labour’s selection process for the Invercargill electorate. We must avoid complacency that might flow from believing today’s good times are permanent. The notion that environmental protection and economic development are potentially conflicting goals is not, in my view, a recipe for success. It removes any expectation that businesses should take responsibility for protecting the environment; or that environmentalists need to consider social or economic costs of environmental outcomes. People’s first consideration when buying food was price, despite claims they might buy based on factors like organic growth, she said. The global financial crisis was the worst economic meltdown in living memory. That it can sweetly awaken, and joyously strengthen and that you need to give it to get it. Sarah Peirse answering the question: what do you know about love? Mr Speaker, my second point I wish to make is the importance of valuing hands on learning within our education system. We must appreciate these very important students who in the future will fix things, build things, be it trucks, motor cars, be it buildings, be it bridges, roads, essential infrastructure and all manner of other things. “Talking about ponies and horse races, if you think of the economy as a horse race, you know it would be silly to put the hobbles on one of the leading horses so the rest can catch up,” – Alister Body. “I don’t think a party that’s on the extreme edges one way or another is going to be beneficial for Maori,” . . . “I think we as Maori also need to realise that compromise is a part of political involvement in New Zealand politics,” . . . Dr Lance O’Sullivan. “I won’t be wanting to see any hint of arrogance creeping in.” . . .